Tranquil PC, of the U.K., is taking preorders for a home server based on the dual-core version of Intel's Atom processor that will be available on Sept. 30, but said supply of the system is "very limited." Tranquil's &#163;299 (US$530) T7-HSG server is based on the as-yet unreleased Atom 330, a dual-core chip that was announced at the Intel Developer Forum in San Francisco last month, as part of a new motherboard designed for low-cost desktops. At that time, Intel didn't reveal details of the chip. But Tranquil said the Atom 330 has two 1.6GHz processor cores. 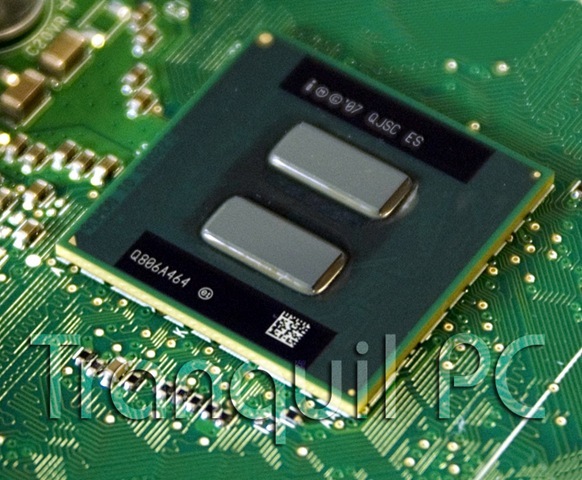 Instead of two cores on a single piece of silicon -- like Intel's other dual-core processors -- the chip appears to package two 1.6GHz Atom processors in a single chip, according to a picture posted on Tranquil's corporate blog. This suggests a rushed design. Dual-core processors are far more complicated than simply putting two chips together. These designs are optimized so cores can share the processor's limited memory access most efficiently, and generally include sophisticated power-management systems to reduce power consumption when both cores aren't required. Intel doesn't comment on unreleased products. It wasn't immediately clear how Intel has addressed these issues with the Atom 330, but the chip's design may explain why a mobile version of the dual-core Atom hasn't been announced. Like other Atom systems, the T7-HSG has some hardware constraints relative to systems based on other processors, a strategy adopted by Intel to help segment the PC market and prevent sales of computers based on more expensive Intel chips from being cannibalized. For example, the dual-core Atom motherboard has a single memory card slot that can hold up to 2G bytes of DDR2 memory. Most computers can handle twice that amount with two memory slots. The limited availability of the T7-HSG matches the ongoing shortage of the Atom processor. Demand for Atom has repeatedly surpassed Intel's forecasts and the company has struggled to match the fast-rising popularity of the chip. The production constraint lies in the back-end testing stage of the manufacturing process, where Intel says there is not enough capacity available to meet demand for the low-cost Atom chip. The problem is compounded by the lower selling price of Atom relative to Intel's other products, which generate more revenue for the company and therefore have priority in the testing process.